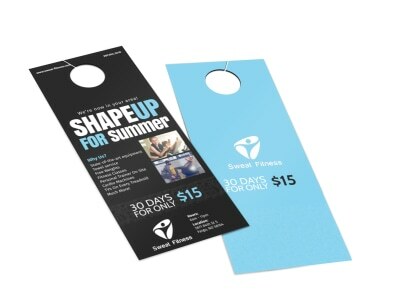 Trim the fat from your marketing plan with door-to-door marketing using door hangers. 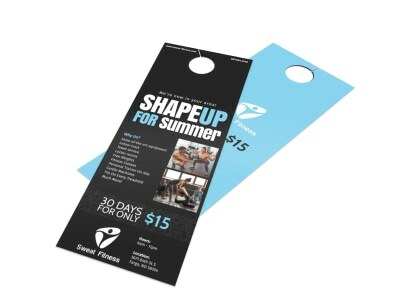 Our sports and wellness door hanger templates make it easy to reach a broad audience to advertise your monthly gym special, summer basketball camp, yoga retreat, or other service or product offering. Use our online editor to upload elements you want to include in your design, including images, graphics, and other components, and then add text in the fonts and colors of your choice. Once you have locked into a design that turns heads, print your door hangers from any location, or trust our printing professionals to do the job for you using premium paper and ink.